There are a variety of statistics, both general and specific, that explain what happened Saturday at Nusenda Community Stadium. But they reduce the game to cold numbers when it really just came down to will. That the Bulldogs didn’t show up ready to play their brand of football, particularly in the first half, was obvious. 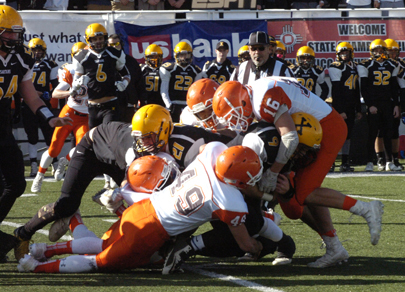 But it wasn’t a matter of underestimating the technical abilities of their opponent; they’d done their homework and were well aware St. Pius was a team propelled predominantly by scrambling workhorse quarterback Drew Ortiz. What the ‘Dogs perhaps overlooked was the mindset of a team desperate for its first state championship in more than 15 years. The Sartans were confident at best, cocky at their worst. But they took the field Saturday to win a football game. And by the time Artesia was able to find the drive that had carried them to a top seed in Class 5A, it was simply too late. The damage was done. 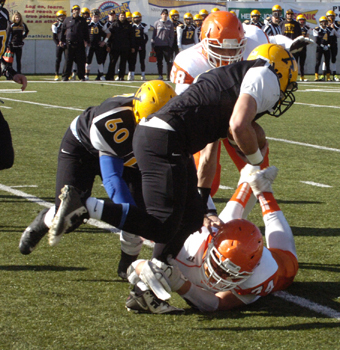 The Bulldogs were denied their shot at a threepeat, 34-24. 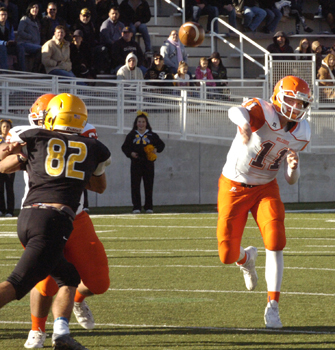 “We had our chances,” Artesia head coach Rex Henderson said Saturday. “I think, at the end of the day, they made more plays than we did. And certainly, there’s things as a coach you can look back on and say we maybe should’ve tried this – some halftime adjustments that we probably should have made at the end of the first quarter, things that could’ve been thought of better. 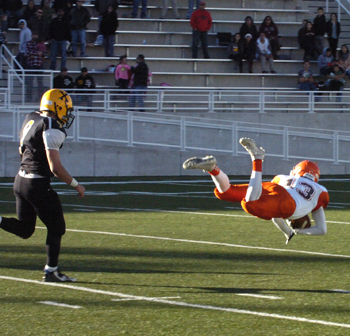 But for a last-second field goal, Artesia was unable to generate much offense in the opening half. 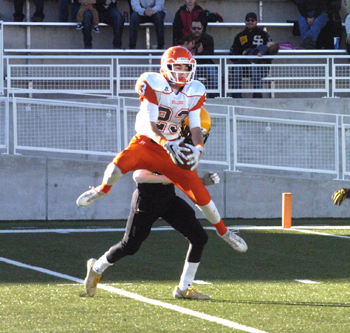 Its passing game was out of sync, hindered further by two first-quarter interceptions. Even so, they found themselves trailing by just 10 at the break, 13-3. The troubles seemed to switch sides in the second half, however. The offense scored to cap each of its drives, but the defense couldn’t produce a stop, with missed tackles frequently giving the Sartans extra yards as they more than doubled their first-half rushing total. The Bulldogs were driving to start the game Saturday, marching from their own 25 to the Sartan 39 on passes from junior quarterback Taylor Null to Chaney Hardt, Isaiah Weideman, Kameron Aguilar and Ryan Gallegos. But on first and 10, an underthrown ball resulted in a pick. 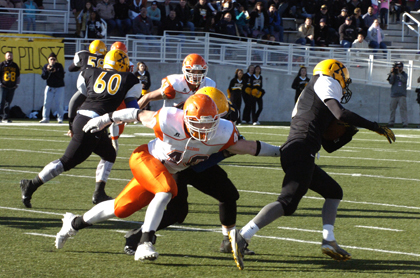 Starting from their own three, St. Pius was ultimately forced to punt, but a quick three and out by the Bulldog offense sent the defense quickly back onto the field. Sartan quarterback Drew Ortiz would make his second aerial attempt of the game count, catching the secondary out of position for a 46-yard touchdown toss with 2:45 to go in the first. opportunities to tie the game, and Pius made it 13-0 with 34 seconds remaining in the half on a 12-yard pass from Ortiz to Ryan Mcgaha. Chandler Youtsey posted a block on the PAT following that score, allowing the Bulldogs’ deficit to stand at 10 following the late field goal. Null connected twice with Cody Fuentes for a combined 68 yards to set up that kick, which Tanner Harris delivered from 27 yards out. St. Pius got the ball to start the second half and would march quickly from their own 29 on long runs and short passes by Ortiz, who found Mcgaha again from the 10 to make it 20-3 on a nine-play, three-and-a-half minute drive. 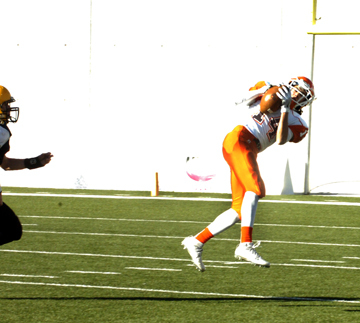 David Barlow collected four Null passes for 40 yards on Artesia’s ensuing possession, and after Robert Fernandez converted on third down with an eight-yard run, Null hit Hardt in the end zone from the four to bring the ‘Dogs back within 10, 20-10, with 3:56 left in the third. negated by a ruling that the ball hit the ground, and Ortiz would ultimately proceed through four tackles for a 24-yard touchdown run 43 seconds into the fourth that made a comeback a tall order, 27-10. Null converted twice on fourth down with 14-yard passes to Barlow and Tyler Greenwood, and once on third by way of a four-yard toss to Fuentes before finding Hardt again from the four to make it a 10-point game once again, 27-17, with 6:15 on the clock, but another long TD run by Ortiz, this time from the 33, kept the Bulldogs from gaining ground. A diving 38-yard reception by Barlow helped set up the ‘Dogs’ final TD, a nine-yard pass from Null to Greenwood with 1:38 to go. The Bulldogs recovered the initial onside kick, but a whistle was blown, forcing a re-kick that was caught by the Sartans. From there, Ortiz was able to run out the clock. complete the stop. We’d get them to third and long and just couldn’t finish it. The Bulldogs finished with 340 yards of offense to the Sartans’ 334 on the afternoon. Null was 33 of 48 for 328 yards passing and three touchdowns. Fuentes and Barlow led the ‘Dogs in receiving with six catches for 92 yards and seven for 84 respectively, while Hardt caught two touchdown passes amidst nine receptions for 49 yards. 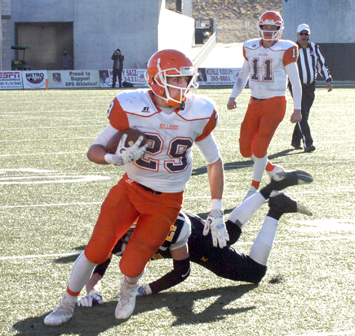 Artesia turned to its quartet of running backs – Weideman, Fernandez, Gallegos and JR Bustamonte – just nine times on the contest for a combined total of 24 yards. Ortiz was 14-182 rushing and 12-20-144 passing on the day. The loss was a frustrating one to say the least for an Artesia squad that had its heart set on the program’s record 30th state championship and a rare threepeat that would have been the first since the 1996-98 seasons. But despite the difficult nature of the game, the Bulldogs conducted themselves with grace and class – as much a hallmark of the school’s storied success as the blue trophies themselves. Zarazua, Jharyss Granger, Bruce Bates, Dominic Madrid and Alex Salcido but welcome back a strong core of experience in 2017. “We’re really proud of our athletes,” said Henderson. “We were proud of the effort they’ve given throughout the year to get to this point. Going back to last offseason, they really wanted to threepeat. It’s been a while since we’ve done that. They wanted to do it, it was a goal they set and worked for, and they came about as close as you can come to it.